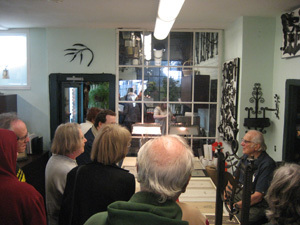 We appreciate the significant interest in tours created by the Jazz Age show! We are still attempting to “catch up” and regret that we’ve temporarily suspended tours, hopefully to resume spring 2018. We are happy to add your request to the waiting list and notify you when we resume. Please email your contact information, number of individuals and preferred dates and times. 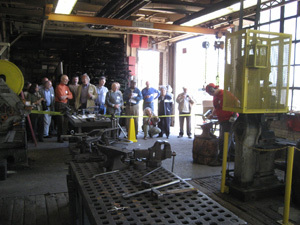 Tours of our office and forge shop are available on a select, by appointment basis. Because we are a small, working studio, visits must be arranged well in advance. We regretfully can not honor drop in visits. Please contact our office to discuss the possibility of a visit at (216) 881-6000 or email us at Info@RoseIronWorks.com.